In 1889, the people of the Fishtown section of Mystic commissioned this chapel as a place for Sunday school and prayer meetings. Construction, by local Mystic builders, took only three weeks. The chapel never had its own pastor. Local ministers would hold occasional services here on Sunday afternoons or weekday evenings. Strong religious beliefs had always determined the values and life styles of Southeastern Connecticut’s people. But at the close of the 19th century, a local Protestant reawakening occurred, especially among Baptists and Congregationalists. This activity fell short of a full-fledged religious revival, but it was a unique and significant expression of local religious activism. Newspapers included more and more writings on religious and moral topics. Sunday school picnics and church-sponsored excursions became more popular. And most interestingly, small local chapels like this one were established at crossroad locations in rural areas. 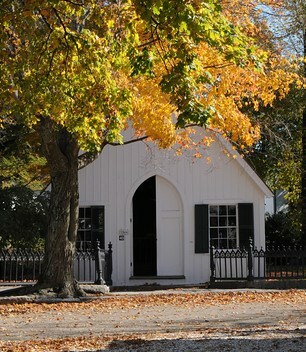 For a few years around 1900, the chapel became a schoolhouse for the Ninth (Groton) School District, but for the next half century the building was unused and neglected. 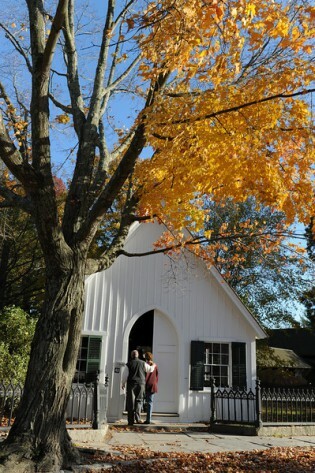 In 1949, the Fishtown Chapel was purchased, moved to Mystic Seaport Museum, and restored. It was rededicated as a chapel in 1950. Six of the 12 benches are original; the remaining benches, melodeon, oil lamp chandelier, brackets, and side lamps came from churches in the area.